Many people who want a handsome lawn do not realize the importance of mowing. A lawn that is mowed to the right height at the right time will resist weeds, insects, and disease, and appear lush and healthy. Infrequent mowing often results in the removal of too much grass at one time, and eventually produce is a lawn that looks thin, spotty, or burned. Unfortunately, grass could also be weakened by mowing to frequently, especially if it is kept short. Mow your lawn based on the type of grass, how long it is and how vigorously it is growing. It also depends on how much water it receives along with fertilizer. The type of grass in your lawn. The fertilizer you apply affects the growth rate of your lawn, and consequently, the frequency of mowing. Lawns that are fertilized often require more frequent mowing. Golf course greens, for example are usually mowed daily. Cool season and warm season grass responds differently to seasonal climate changes. When cool season grasses slow down or become dormant during summer heat, mowing may only be really necessary once every two or three weeks. However, during spring and fall, cool season grasses grow more vigorously and usually need mowing at least once a week. Warm season grass do not grow at all in the winter and slowly in the spring and fall. Mowing is required infrequently during these times. But during the high temperatures of summer, growth is vigorous and mowing should be more frequent. During periods of vigorous growth, many people find it convenient to mow their lawns on a weekly schedule. Unfortunately this is not appropriate for all lawn grasses. Even though you could establish a general schedule for both cool season and warm season grass, different types of grass still grow at different rates. For example, although common Bermuda grass may do well with mowing once a week during mid summer, well fertilized improved Bermuda grass may need to be mowed every two or three days. 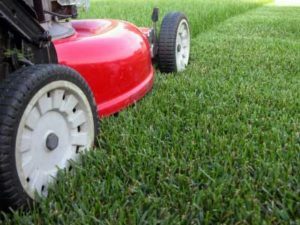 If you can, match your mowing schedule to the growth rate of the grass, your grass will be much healthier and able to deal with weeds and drought.